Finding Caribbean airlines options to Tortola can be quite a chore. I'm gonna make it easy on you by giving you the best way to find paradise. The actual name of the Tortola airport is, Terrence B. Lettsome Airport (Airport Code-EIS). Its located on Beef Island which is accessible to Tortola via the Queen Elizabeth II Bridge. 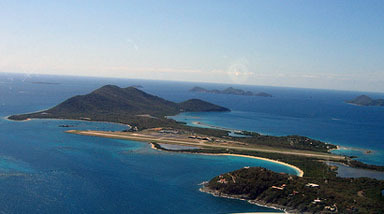 The Tortola Airport (formerly the Beef Island Airport) is not one of the larger air strips in the Caribbean. It only can only accommodate smaller 64 passenger turbo prop airplanes. This is the reason many Caribbean airlines don't come here. Thus costing us all an extra flight. If your budget minded, take a look at the Getting Here Page for a lower priced option. The flight in is amazing, you get to see so much from the air that normally is available only to the pelicans. An extention was put on the runway back in 2004 which actually extends into the bay. When landing it looks like you're going to land right on top of the ocean. Don't worry you will be landing in paradise, not the ocean! No Caribbean Airliners have a direct flight to Tortola from the North America or Europe. This is inconvenient for some, but it's the reason I think Tortola is just the perfect size. You must catch a flight from Antigua, Puerto Rico, St. Kitts, St. Maarten, or St. Thomas. If you plan on flying from the U.S., a flight from San Juan (SJU) is your best option. I have used this connection several times. SJU has a much wider variety of domestic and Caribbean airline options. From Canada and Europe, you should connect in Antigua (ANU). LIAT provides service to Tortola and a host of other Caribbean destinations. The Tortola airport is your typical Caribbean airport, in that it's not very large. The airport is pretty sparse as far as amenities go. If you end up getting delayed there, don't worry I've got a nice plan for how you can spend your time. Being stuck at any airport due to a layover is usually not that much fun. The nice thing about waiting for your flight is that in case you forgot, you are in paradise. So head out of the airport, hang a left and make the short walk to Trellis Bay. There you can get some food, an island beverage, or even hit the beach!